Nynas Endura Z3 is a highly modified binder with good resistance to deformation that has been developed for asphalt surfaces that are subjected to particularly heavy loads. Conventional asphalt surfaces are unable to withstand these kinds of extreme loads. Cost-efficient special solutions are required in order to avoid rotting and deformation from static loads. 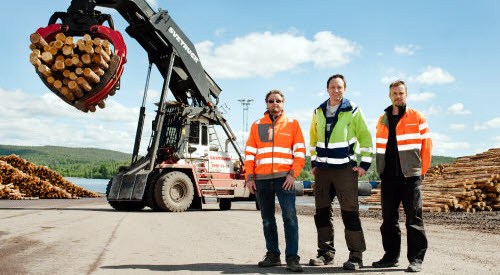 Lemminkäinen, the contractor who was engaged through SCA on behalf of Peab to choose a suitable solution for the storage areas at the Bollsta sawmill. The yard is located near Kramfors in Northern Sweden, where large volumes of timber are handled here every day, with an annual production of more than 500 000 cubic metres of timber. The complexity of the assignment required extensive preparations. The big challenge was to choose the right design to meet the client’s demands for stability. The storage areas would need to withstand both static loads, strain from the heavy vehicles, as well as large temperature swings over the life of the pavement. A highly durable asphalt was selected using Nynas Endura Z3 as a binder. Usually products designed with focus on stability are more viscous, but Nynas Endura Z3 combines great performance with both workability and compactability during the production and placement of the asphalt. The work began with Lemminkäinen’s paving crew milling and patching the area in question in order to achieve a really level surface. They then placed a layer of 120 kg/m2, representing an average thickness of 50 mm. In total they used almost 1,200 tonnes of asphalt. This was the first time that Lemminkäinen had used Nynas Endura Z3 in Northern Sweden, and it all went extremely well, both with regards to logistics and the actual paving work. There were particularly strict demands at Bollsta on how the work has to be carried out. Everything from transport operations to barriers and other safety arrangements had to be meticulously planned. This meant that it was possible for production at the sawmill to continue operating as usual during the paving work. Lemminkäinen’s supervisors held two meetings each day with the client to make sure that nothing was overlooked. Dowload information as a pdf.